When I take time in the morning to spend time with God, to come to the waters and drink, I feel and know the Lord with me throughout the day. But there’s this stubborn person inside of me that doesn’t want to do that. Instead this person wants to sit and read the newspaper. I know it’s my fallen self, the one I inherited from Adam and Eve, wanting to turn away from God and go my own way. Forge my own path for the day. Bury myself in my busyness. 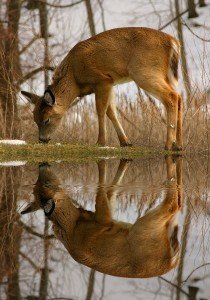 What I want more than anything is what David had: “As the deer pants for the water, so my soul longs for you, O God.” (Ps 42) Yet I continually prevent it. I just pick up the newspaper.